Low Carb Made Easy is packed with 15 quick and easy low carb recipes suitable for all the family. Raising The Bar contains 15 utterly delicious recipes for no bake protein bars that you can whip up in just a few minutes. Diets don’t have to be dull, we promise! Low Carb Made Easy is packed with 15 quick and easy low carb recipes suitable for all the family. I have created all the recipes with fussy eaters in mind so you can even serve up low carb meals to your family and friends and they won’t even realise it’s your ‘diet’ food – I promise. 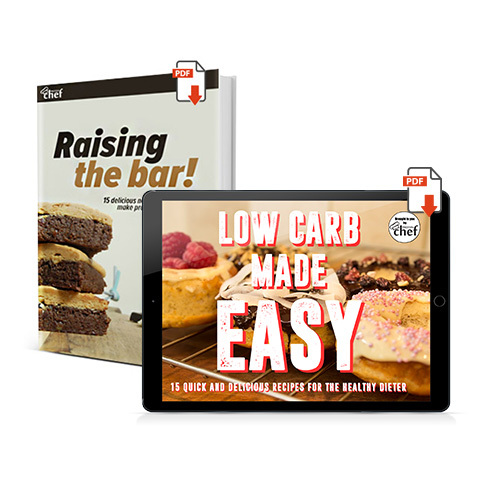 Low Carb Made Easy contains the recipes including all the nutritional information for all of these delicious recipes. It’s time to stop suffering with bland uninspiring low carb meals and add real fun and flavour to meal times! Protein bars can be full of all sorts of strange ingredients and not to mention expensive, which is why making your own is a much healthier and cheaper option. My recipe book contains 15 utterly delicious recipes for no bake protein bars that you can whip up in just a few minutes. These include high protein ‘Snickers’ bars, Chocolate Fudge Brownie protein bars, Lemon & White Chocolate Chunk protein bars and many more! – Simple step by step, easy to follow instructions. Once you’ve realised just how easy it is to make your own protein bars, you’ll never need to buy them again! Right now I am offering a 20% off Sukrin voucher with every purchase of Raising The Bar. Sukrin specialise in low carb flour and sugar alternatives, many of which you’ll find in this book! Please note there is a limit of 2 download attempts for both of the e-book, therefore I recommend you download it using a PC to avoid possible errors using tablets or mobile devices. Please also note that some email providers may send the download link to your trash/spam folders, so should it not arrive promptly please check here.